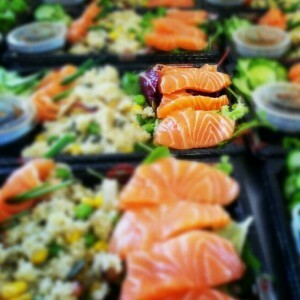 Healthy fast food with our sushi delivery service! Sushi Delivery: Fast Food Can Be Healthy! Fast food – it’s a term that seems somewhat synonymous with quite a few things that have nothing to do with good health and sensible nutrition. Pretty much since the UK’s obsession with the stuff took off quite some time ago, it’s been largely assumed that in order to make food fast and affordable, you have to be willing to sacrifice some of the quality…and certainly some of its nutritional value. That is, unless it’s the sushi takeaway you’re talking about. Chances are it won’t have escaped your attention that sushi delivery is a pretty big deal in London right now. But what’s really interesting is not how another option has been added to the fast food menu for the capital, but how there’s finally something everyone seems to be in love with that’s also genuinely healthy. Swap your regular takeout for a sushi delivery in London and you might just find it does wonders for your health! How is it that a sushi delivery can be so superior to say a pizza or a kebab? Well, the secret lies in sushi’s wonderful simplicity and when you break any popular sushi down to its component ingredients, there really could not be anything simpler. All you’re looking at is the rice, the vegetables and the protein of your choice – unless you decide to get rather fancy with it that’s all there is to it! It’s the moment you start to overcomplicate something that you end up spoiling it and detracting from its nutritional value – sushi has always been simple and should be served no other way. Something else to bear in mind is the way in which a vast array of healthy ingredients are at their absolute healthiest when served raw. Cooking has a habit of diluting the vitamin and general nutrient content of vegetables for example, while some of the most beneficial oils of all can be lost from fish during the cooking process. So if you order a sushi delivery in London where all or most of the ingredients are raw, they’re still holding onto 100% of their goodness. One of the biggest problems these days is the way in which so many seem to have forgotten than the most important rules of all in the health and fitness world are moderation and balance. There really aren’t any foods out there that anyone should be eating exclusively as if their lives depended on it, nor is there any real need to be scared of the occasional indulgence here and there. What makes the very best handmade sushi in London so special and unique is the way in which it makes both balance and moderation possible and affordable. By varying the types of sushi you order, the vegetables, the fish, the sides and so on and so forth, you can make sure you’re looking out for your health while chowing down on the stuff you’re in love with. It’s fresh, it’s fast and it’s fabulous for your health – try saying that about most fast foods!